Gov. Larry Hogan and Public Safety Secretary Stephen Moyer at the Baltimore City Detention Center Thursday. Photo above: Gov. Larry Hogan and Public Safety Secretary Stephen Moyer at the Baltimore City Detention Center Thursday. Gov. Larry Hogan’s performance in Baltimore Thursday evoked memories of William Donald Schaefer, the legendary “Do it now” mayor and governor, as Hogan announced the immediate closing of the Baltimore City Detention Center. Hogan’s large bald head from his chemotherapy added to the impression, but it was more the tone, attitude and approach that was Schaeferesque: impatient, angry, concerned with the people affected, and denigrating those other politicians who couldn’t get the job done. “We promised to clean up state government and that’s exactly what we’re doing,” Hogan said. And we’re saving money too, $10-15 million a year. A half-hour before the announcement in the bowels of the antique jail, the co-chairs of the legislative commission that studied the jail in 2013 issued a scathing statement. “We were disappointed to receive notice of Governor Hogan’s plans through the media,” said Sens. James Ed DeGrange, D-Anne Arundel, and Guy Guzzone, D-Howard. “Consistently, the Governor has circumvented the Legislature rather than working together to find bipartisan and consensus-driven solutions. Our bipartisan commission spent long hours reviewing the facility needs of BCDC in order to develop a comprehensive redevelopment plan for the facility, and would have been able to provide input into this process. What about the 10-year plan to replace the jail legislators had recommended, Luke Broadwater from the Sun asked Hogan? Leaders of the union that represents more than 1,000 workers at the jail — the state said it was 772 — said its contract called for consultation as well. But it wasn’t told about the plan till Thursday morning. “They should have been notified and they weren’t notified,” said AFSCME executive director Glen Middleton. On the other hand, Middleton, who worked 17 years at the jail, didn’t disagree with closing the decrepit facility. “This place is unsafe, it’s insecure,” he said. Was Hogan going to try to turn running the jail back to the city, a reporter asked? “Not at this time,” but they haven’t decided on other further action. 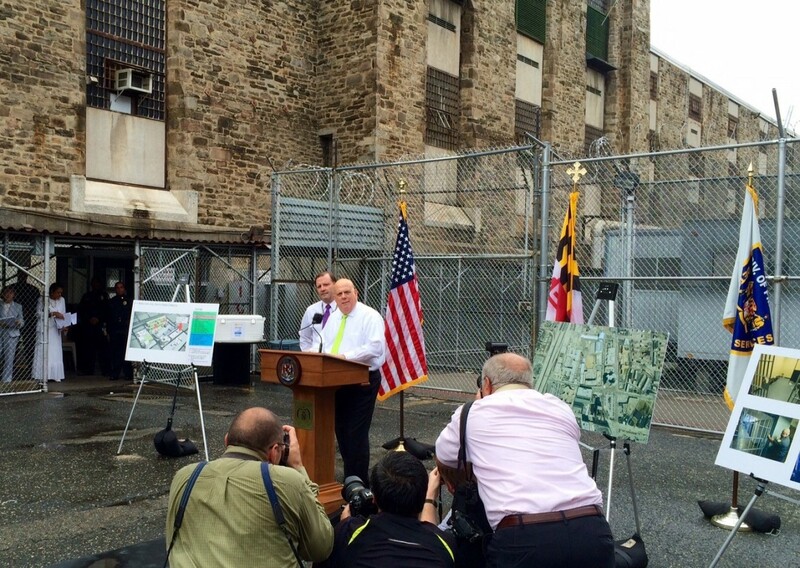 But why this was the only city jail in the country run by the state was still a puzzlement to Hogan. What will replace the jail, as prisoners are sent to other state facilities? They’re not sure for now. Those decisions will come later. “This facility should have been closed years ago,” Hogan repeated. “Do it now,” as William Donald Schaefer might have said, and deal with those pesky legislators and unions later.